• Determination of glucose uptake in whole cells and evaluation of effects of ligands or drugs on glucose transport. • Safe. No radioactive material is used. • Sensitive and Accurate. Detection limit of 0.1 µM and linearity up to 5 µM 2-DG6P. • Simple and Convenient. Can be automated as a medium throughput assay for glucose transport in cells. • Glucose Uptake has a variety of methods and transporters, and depends upon the metabolic demand of the cell type and availability of glucose. There are over ten different facilitated diffusion glucose transporters which transports glucose down its concentration gradient without ATP hydrolysis. In the kidneys, secondary active transport is used to uptake Glucose against its concentration gradient to ensure that very little glucose is excreted in urine. BioAssay Systems fluorescent cell-based glucose uptake assay uses 2-deoxyglucose (2-DG), a widely used glucose analog because it can be taken up by glucose transporters and metabolized by endogenous hexokinase into 2-deoxyglucose 6-phosphate (2-DG6P). 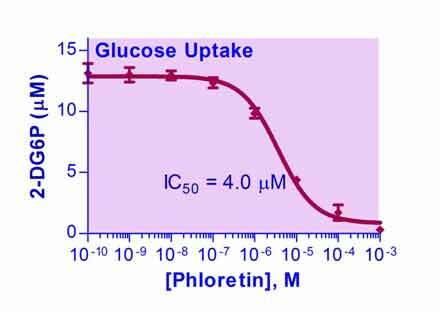 2-DG6P accumulates intracellularly because it is not a suitable substrate for phosphoglucose isomerase, the next step in glycolysis. The cells are lysed, and excess NADP and glucose 6-phosphate dehydrogenase (G6PDH) is added to metabolize 2-DG6P and generate a molar equivalent amount of NADPH. The NADPH is then measured using a G6PDH recycling reaction to amplify the signal and generate a fluorescent signal measureable at λex/em = 530/585 nm proportional to the concentration of 2-DG6P. 2. What is the shelf life of this kit? The shelf life is 6 months from the date you received the kit. The reagents are ready to use. No reagent reconstitution is needed. 3. Does the assay kit work in particular cells? Yes, this assay works in all mammalian culture cells. We have not tested this kit in other cells, such as bacteria, yeast cells etc. 4. How do I normalize the results? One method to normalize the results is to divide the glucose uptake activity against total number of cells or total cellular protein in the assay well. This would require a protein determination kit (e.g. BioAssay Systems' QCPR-500 or QFPR-200). 6. Do I need to use a standard curve with each assay run?